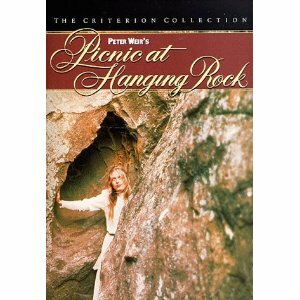 "Picnic at Hanging Rock" (1975) starring Rachel Roberts, Anne-Louise Lambert and Vivean Gray is not your standard horror movie. It is an Australian film that takes place on Valentine's Day 1900 at Appleyard College, a school for girls. The school is run by the stern Mrs. Appleyard. It is St. Valentine's Day 1900 and Mrs. Appleyard has sent the girls on a field trip for the day to Hanging Rock, a large rock formation where they are to enjoy a picnic outdoors. We see the girls getting into their Victorian era dresses, hats and gloves and get into the carriage with several teachers to go off on their outing. Once there, we watch the group eat, read, nap and laze around in the hot summer weather. It's all so civilized! Four of the girls decide to explore the rocks a little more and as they get higher up into the outcroppings, the girls experience dizziness and disorientation. Three of the girls then go into a cave and the 4th girl goes running back screaming to the rest of the group. The result is three girls and one teacher go missing at the rock. The rest of the movie is about the mystery of what happened to the missing students and teacher. All the townspeople suspect foul play. The disappearance has become fodder for all the newspapers and Mrs. Appleyard starts losing control over the school. Hysteria with the girls abounds! This movie mainly takes place on hot sunny days. It is not your average horror movie that builds suspense and horror using darkness. The atmosphere is palpable and Hanging Rock is an eerie and mysterious presence. This is an excellent example of atmospheric horror.